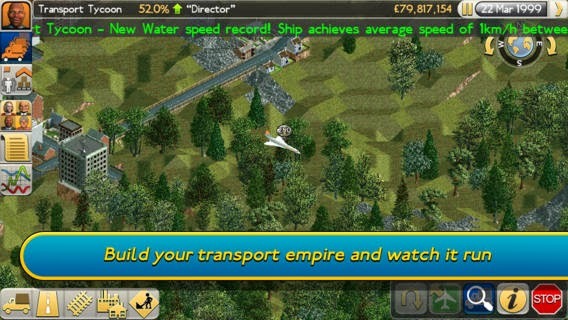 Transport Tycoon arrives on Android, Android Tablet, iPad and iPhone. Transport Tycoon is a legendary simulation management game by Chris Sawyer. Developed by Origin8 Technologies under Sawyer's direction, the game is now available on iPad, iPhone, and Android phones and tablets for £4.99 (GBP) / $6.99 (USD) / €5.99 (EUR). In Transport Tycoon, players become entrepreneurs in control of a transport company, competing against rivals to make as much profit as possible by transporting passengers and various goods by road, rail, sea and air. To build an empire, players construct transportation routes consisting of stations near industries or towns, each often utilizing different methods of transportation such as trains, ships, airplanes, trucks and more. A number of factors determine a player's success including efficiency at moving goods from one station to another and therefore earning higher ratings, picking up resources or passengers and delivering them to where there is demand, and time, distance and quantity of goods delivered.